Muleni Safaris Uganda observes that PARC National de Volcans is also one of Rwanda's conservation epicenters, where many non-profit organizations base their operations. Muleni Safaris Uganda`s Visitors can pay homage to the legendary scientist and gorilla advocate Dian Fossey with a hike to her tomb or a visit to the Dian Fosse Gorilla Fund that continues her legacy of research and advocacy to this day. 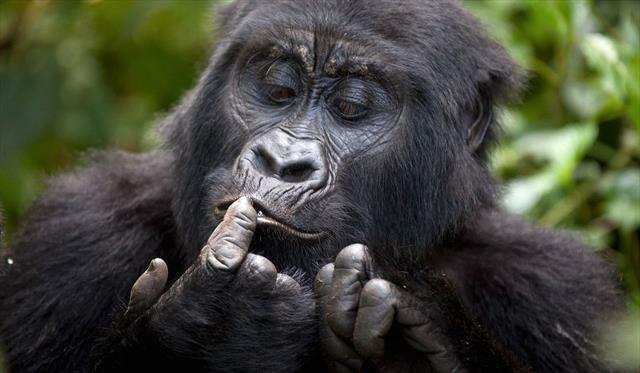 To minimize possible transmission of human diseases, Muleni Safaris Uganda`s visitors are advised to maintain a distance of 7m (about 22 feet) from the gorillas. If you are sick with a cold, flu or other contagious illness, please do not visit the gorillas. Tracking can be done by persons of age 16 and above. Susa — The largest group with 38 gorillas. They’re hardest to trek as they tend to range high into the mountains. They have rare 5 year old twins named Byishimo and Impano. Sabinyo— 17 members Sabyinyo is an easily accessible group led by the powerful silverback Guhonda. Amahoro — 19 gorillas, led by teh calm and easy going Ubumwe. To reach Amahoro it’s usually a fairly steep climb but it is well worth it! Agashya — (formerly known as Group 13) today it has 22 members - a very positive sign for conservation. Kwitonda— 23 members led by Akarevuro, originally habituated in DRC so they tend to range quite far making it a moderately difficult trek. Hirwa —this group has 18 members and only fairly recently formed from former Group 13 and Sabyinyo family members. They are led by Munyinya. After breakfast, you will depart for the headquarters of the Park where your driver-guide will accomplish the necessary formalities for you. You will meet your ranger guide(s) for a briefing about the greatest animal experience ever! Overnight and dinner La Bamboo Lodge –Parc Volcanoes (Luxurious premier Camp) Meal plan B, L, D.